I’m guessing that projects could be used by learners to split out different projects with a course, or perhaps use a project as the basis for a range of activities within a course. Notebook files are opened in to a tab. Multiple notebooks can be open in multiple tabs at the same time (though this may start to hit performance from the server? pandas dataframes, for example, are held in memory, and the SMC default plan could mean memory limits get hit if you try to hold too much data in memory at once?)? Several users can collaborate on a project. I created another me by creating an account using a different authentication scheme (which leads to a name clash – and I think an email clash – but SMC manages to disambiguate the different identities). As soon as a collaborator is added to a project, they share the project and the files associated with the project. Live collaborative editing is also possible. If one me updates a notebook, the other me can see the changes happening – so a common notebook file is being updated by each client/user (I was typing in the browser on the right with one account, and watching the live update in the browser on the left, authenticated using a different account). Real-time chatrooms can also be created and associated with a project – they look as if they might persist the chat history too? The SagMathCloud environment seems to have been designed by educators for educators. A project owner can create a course around a project and assign students to it. An course folder appears in the project area of the student’s account when they are enrolled on a course. A student can add their own files to this folder, and inspected by the course administrator. A course administrator can also add one or more of their other project folders, by name, as assignment folders. When an assignment folder is added to a course and assigned to a student, the student can see that folder, and its contents, in their corresponding course folder, where they can then work on the assignment. The course administrator can then collect a copy of the student’s assignment folder and its contents for grading. The marker opens the folder collected from the student, marks it, and may add feedback as annotations to the notebook files, returning the marked assignment back to the student – where it appears in another “graded” folder, along with the grade. At first glance, I have to say I find this whole thing pretty compelling. In an OU context, it’s easy enough imagining that we might sign up a cohort of students to a course, and then get them to add their tutor as a collaborator who can then comment – in real time – on a notebook. A tutor might also hold a group tutorial by creating their own project and then adding their tutor group students to it as collaborators, working through a shared notebook in real time as students watch on in their own notebooks, and perhaps may direct contributions back in response to a question from the tutor. So what else would be nice? I’ve already mentioned audio collaboration, though that’s not essential and could be easily managed by other means. For a course like TM351, it would be nice to be able to create a composition of linked applications within a project – for example, it would be nice to be able to start a PostgreSQL or MongoDB server linked to the Jupyter server so that notebooks could interact directly with a DBMS within a project or course setting. I also note that the IPython kernel being used appears to be the 2.7 version, and wonder how easy it is to tweak the settings on the back-end, or via an administration panel somewhere, to enable other Jupyter kernels? I also wonder how easy it would be to add in other applications that are viewable through a browser, such as OpenRefine or RStudio? In terms of how the backend works, I wonder if the Sandstorm.io encapsulation would be useful (eg in context of Why doesn’t Sandstorm just run Docker apps?) compared to a simpler docker container model, if that indeed is what is being used? It’s all very well publishing a research paper that describes the method for, and results of, analysing a dataset in a particular way, or a news story that contains a visualisation of an open dataset, but how can you do so transparently and reproducibly? Wouldn’t it be handy if you could “View Source” on the report to see how the analysis was actually done, or how the visualisation was actually created from an original dataset? And furthermore, how about if the actual chart or analysis results were created directly as a result of executing the script that “documents” the process used? As regular readers will know, I’ve been dabbling with R – and the RStudio environment – for some time, so here’s a quick review of how I think it might fit into a reproducible research, data journalism or even enterprise reporting process. RStudio offers support for the git version control system. This means you can save R projects and their associated files to a local, git controlled directory, as well as managing the synchronisation of the local directory with a shared project on Github. Library support also makes it a breeze to load in R libraries directly from github. R/RStudio can pull in data from a wide variety of sources, mediated by a variety of community developed R libraries. 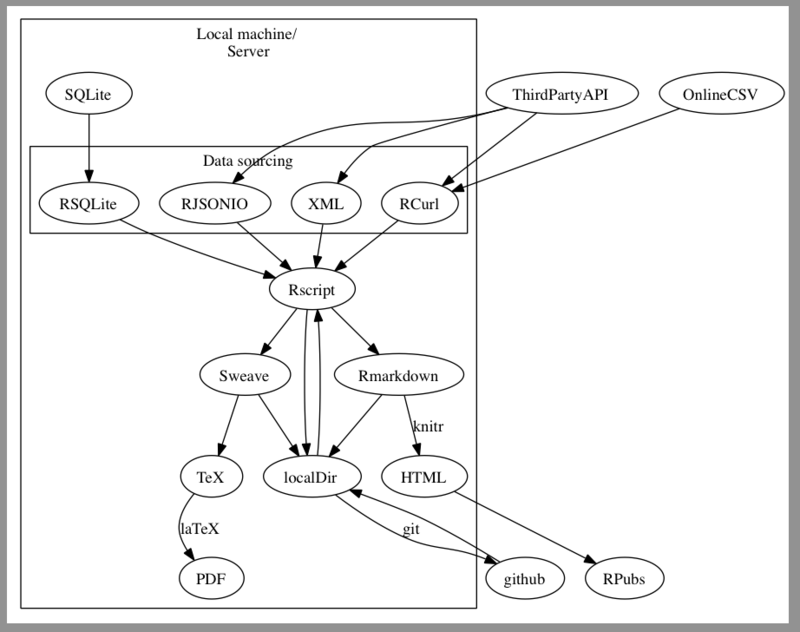 So for example, CSV and XML files can be sourced from a local directory, or a URL; the RSQLite library provides an interface to SQLite; RJSONIO makes it easy to work with JSON files; wrappers also exist for many online APIs (twitteR for Twitter, for example, RGoogleAnalytics for Google Analytics, and so on). A recent addition, RStudio now integrates with RPubs.com, which means 1-click publishing of RMarkdown/knitr’d HTML to a hosted website is possible. Presumably, it wouldn’t be too hard to extend RStudio so that publication to other online environments could be supported. (Hmm, thinks… could RStudio support publication using Github pages maybe, or something more general, such as SWORD/Atom Publishing?!) Other publication routes have also been demonstrated – for example, here’s a recipe for publishing to WordPress from R). Using GetTheData to Organise Your Data/API FAQs? It’s generally taken as read that folk hate doing documentation*. This is as true of documenting data and APIs as it is of code. I’m not sure if anyone has yet done a review of “what folk want from published datasets” (JISC? It’s probably worth a quick tender call…? ), but there have certainly been a few reports around what developers are perceived to expect of an API and its associated documentation and community support (e.g. UKOLN’s JISC Good APIs Management Report and API Good Practice reports, and their briefing docs on APIs). 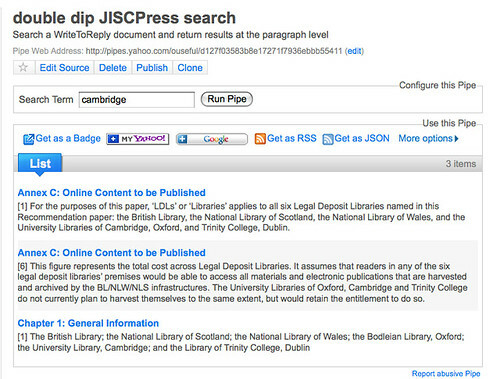 In much the same way that JISCPress arose organically from the ad hoc initiative between myself and Joss Winn that was WriteToReply, I suggested that the question and answer site with a focus on data that I set up with Rufus Pollock might provide a running start to UK Discovery Q&A site: GetTheData. 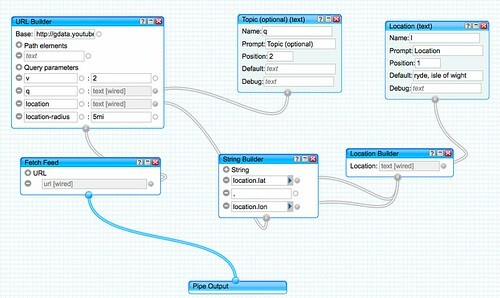 API connections to OSQA, the codebase that underpins GetTheData, are still lacking, but there are mechanisms for syndicating content from RSS feeds (for example, it’s easy enough to get a feed out of tagged questions out, or questions and answers relating to a particular search query); which is to say – we could pull in ukdiscovery tagged questions and answers in to the UK Discovery website developers’ area. Another issue relates to whether or not developers would actually engage in the asking and answering of questions around UK Discovery technical issues. 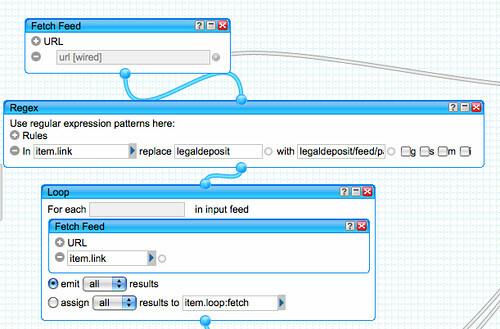 Something I’ve been mulling over is the extent to which GetTheData could actually be used to provide QandA styled support documentation for published data or data APIs, concentrating a wide range of data related Q&A content on GetTheData (and hence helping building community/activity through regularly refreshed content and a critical mass of active users) and then syndicating specific content to a publisher’s site. API/data publishers could post FAQ style questions on GetTheData and provide canned, accepted (“official”) answers. Of course, the community could also submit additional answers to the FAQs, and if they improve on the official answer be promoted to accepted answers. Through syndication feeds, maybe using a controlled tag filtered through a question submitter filter (i.e. filtering questions by virtue of who posted them), it would be possible to get a “maintained” lists of questions out of GetTheData that could then be pulled in via an RSS feed into a third party site – such as the FAQ area of a data/api publisher’s website. Author Tony HirstPosted on June 20, 2011 Categories Anything you want, Radical SyndicationTags getthedata, osqa, rdtf, ukdiscovery2 Comments on Using GetTheData to Organise Your Data/API FAQs? it was immediately obviously that this could be used to provide a local (and optionally topical) feed of Youtube videos to populate a hyperlocal DeliTV video channel for watching on Boxee. So here it is, my DeliTV Local pipe. hit return, check the location and optional search terms are correct and the pipe is giving a plausible output, and then bookmark that page to a DeliTV tag on delicious. (WHen you bookmark the pag, any spacesin your search terms should be replaced by %20. So the above would be bookmarked containing the characters optional%20search%20terms). If you then subscribe to that DeliTV channel via a DeliTV pipe that you have hooked up to your Boxee account, you will be able to watch the channel through Boxee. As recent readers may know, I’ve been blogging lately over on the Arcadia Project Blog, a site I have authoring permissions on but not admin rights. At the moment, comments on the site seem to be disabled except to project team members (I’m not sure how they are whitelisted? ), which is a bit of a pain because I want wider comments on the site. Alternatively, (additionally), commenters who are running the enhanced Google Toolbar can comment on the page using Google Sidewiki. Sidewiki is all well and good (or, errr, not – maybe it’s really evil…?) but it means that unless you’re logged in to Google and running the Google toolbar, or you’ve got a Greasemonkey script or bookmarklet to check for Sidewiki comments related to a page you’re probably not going to see the Sidewiki comments. How to get a JSON version of the feed, wrapped in a callback function that can be used to display the feed, is documented on the GData API site: Using JSON with Google Data APIs – just add ?alt=json-in-script&callback=myFunction. See it in action here: Wanted: Library Hardware Hacker for Desktop Tattle Tape Detector (bottom of the page). A general purpose script would add the script dynamically using an encoded version of the URI for the current page. Something like this, maybe?